Rapid Set cement technology is engineered for providing structural strength in one hour, reduced shrinkage, low permeability, and superior resistance to sulfate attack. This standalone cement, unlike other CSA cements, does not require binders or additives to achieve its superior performance. Its low carbon footprint makes it a highly sustainable alternative to portland cement. Concessions don’t need to be made between speed and performance. With Rapid Set® Cement technology, you can achieve speed and exceed performance. Decades of proven in-service performance, extensive independent testing, and collaborative industry and academic testing programs demonstrate the exceptional performance of Rapid Set. Rapid Set Cement products gain structural strength in 1-2 hours, allowing quick return to service, and saves you significant time and money. With Rapid Set® Cement technology, drying shrinkage is reduced to near zero. You get increased strength and the potential for cracking is minimized or eliminated without using of additives. Rapid Set cement concrete is 3 times stronger than portland cement concrete. Extensive independent fatigue testing shows Rapid Set® Cement concrete achieves a service life of up to 100 years, twice the lifespan of portland cement concrete. This extended lifespan maximizes asset life, minimizes lifecycle costs, and ensures maximum return on the asset investment. 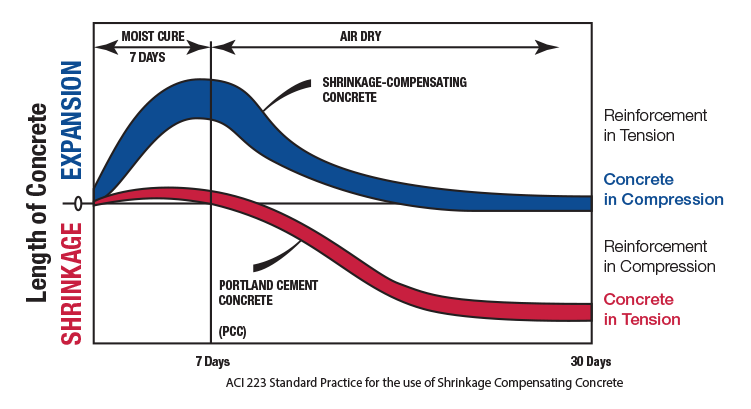 Komponent® shrinkage-compensating cement technology is engineered to achieve a higher quality cement that overcomes the shortcomings of traditional portland cement, specifically excessive shrinkage, susceptibility to sulfate attack, and destructive reactions with certain aggregates. Komponent is used in all types of structures and concrete elements to counteract drying-shrinkage cracking. Komponent offers an effective and economical way to minimize cracking caused by drying shrinkage. Komponent eliminates detrimental tensile stresses that lead to shrinkage cracking and is used to prevent drying shrinkage and edge curling in slabs and toppings. It also helps eliminate repair and maintenance costs, and addresses costly challenges related to restraint-to-shortening in post-tensioned structures. Komponent can be installed in large placements, up to 25,000 square feet, without control joints. 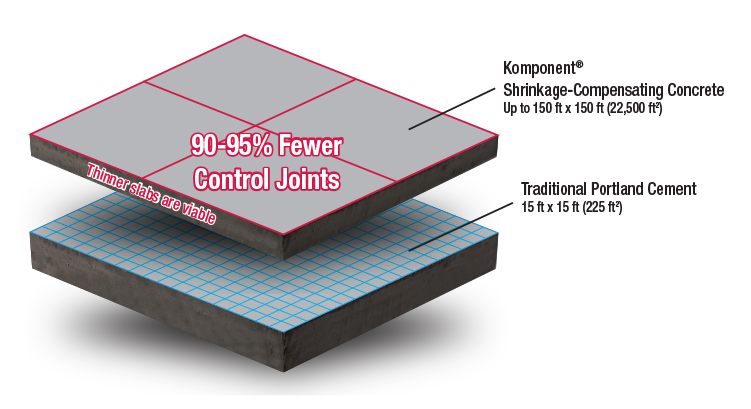 Crack-free floor slabs have been constructed with Komponent Shrinkage-Compensating Concrete with joint spacing up to 150 feet. Eliminating saw cut joints and sealing allows for significant savings during installation and in long-term maintenance costs. Curling of floor slabs at joints is also greatly reduced or eliminated, reducing corner breaks and spall repairs. Restraint-to-shortening challenges in post-tensioned applications. Edge curling, spalls and corner breaks. Support column movement and shear wall stresses in post-tensioned structures and reduce reinforcing steel 4. Waterstops and minimize leakage and seepage points in containment structures. Installation efficiencies by minimizing or eliminating placement and treatment of control joints. The aesthetics of polished and architectural concrete designs. Length between expansion joints (up to 3:1 length to width ratio; longer, narrower design spans can also be achieved). Joint spacing up to 300 ft.
Durability and lower permeability for maximum service life.